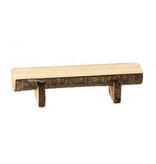 Gluckskafer branch wood bench Dimensions: approximately 9 x 3.5 cm SAFETY RATED FOR AGES 1.5+ Develops the senses and an affinity with nature from an early age. Finely polished hazelnut wood and basswood is used for the gluckskafer toys. They are allowed to dry completely naturally with no external influences, explaining their magnificent appearance. The branch wood is in harmony with nature and the ideal way for children to develop their powers of sensory perception in contact with natural materials.